There are 2033 posts in this topic. 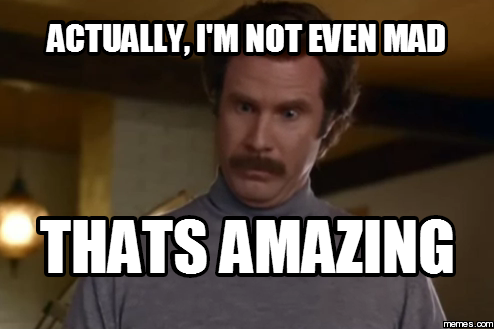 You are on page 41 of 41. A bit of fine etching on the top of the wooden flipper bats and I'd say that's a $100 mod. 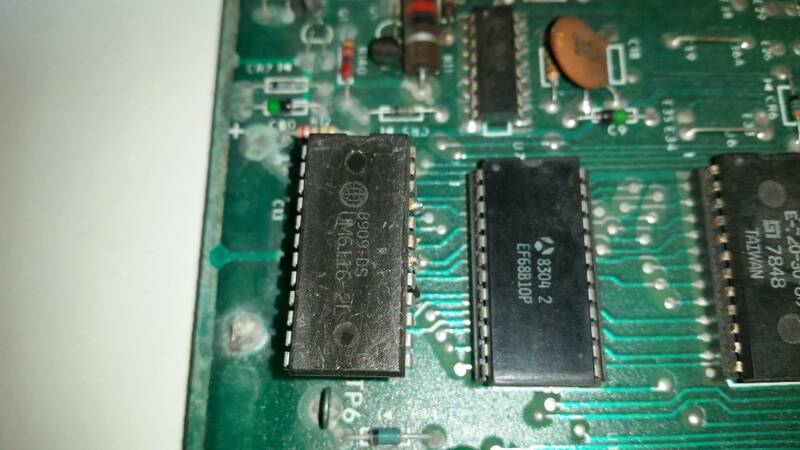 Found this on a battery damaged classic bally MPU. 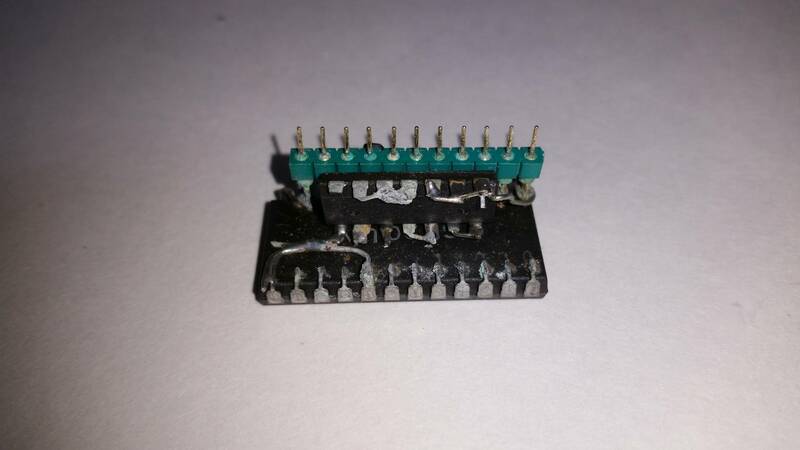 Someone adapted a 6116 RAM chip as a replacement for a 5101 RAM chip. No idea. If it did, it probably wouldn't now due to the corrosion. 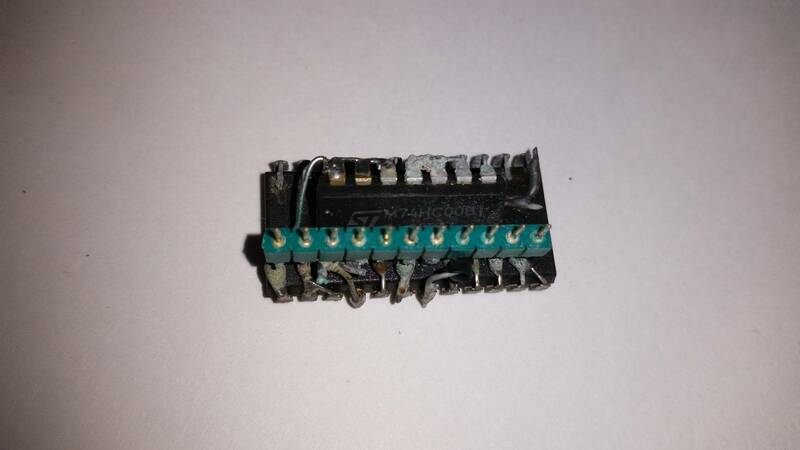 Is a 5101 chip that hard to come by or the guy that impatient , that they would go thru all the time and effort to try and get that chip to work? 5101's are obtainable. Like with most hacks, the right part probably just wasn't on-hand. I wish I had the knowledge it takes to make these kind of hacks and have them work. Fools cannot do this kind of work. 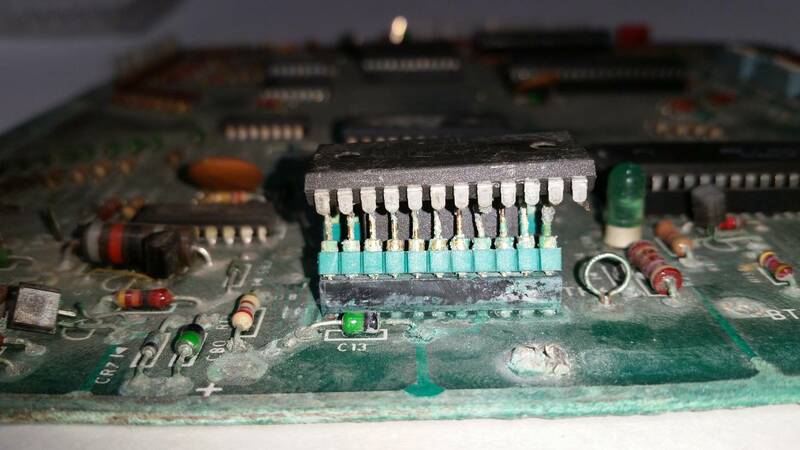 In the early '80's we were scrambling for memory components for service parts. 6800 series microprocessors too. Hard to believe there was no internet for ordering stuff either. That last sentence was key. I'm not exactly old but I do remember what it was like hunting for obsolete parts for anything before the web was around. Hell even in the web's infancy, many of us were trading classic car parts via model- or genre- specific email lists...kind of like Vectorlist was for vector monitor video game enthusiasts. I think it was less than 10 years ago that I finally unsubscribed from Bob Ford's 55-56-57 Chevy email list. Paper publications ruled before then, and thumbing through the Hemmings Motor News was a chore when hunting for hard-to-find parts...a very welcome resource, though. And because all that was mentioned above... Pinball prices were low. Yeah, but yours has TWO of them. It's a mod so nice,they had to do it twice! 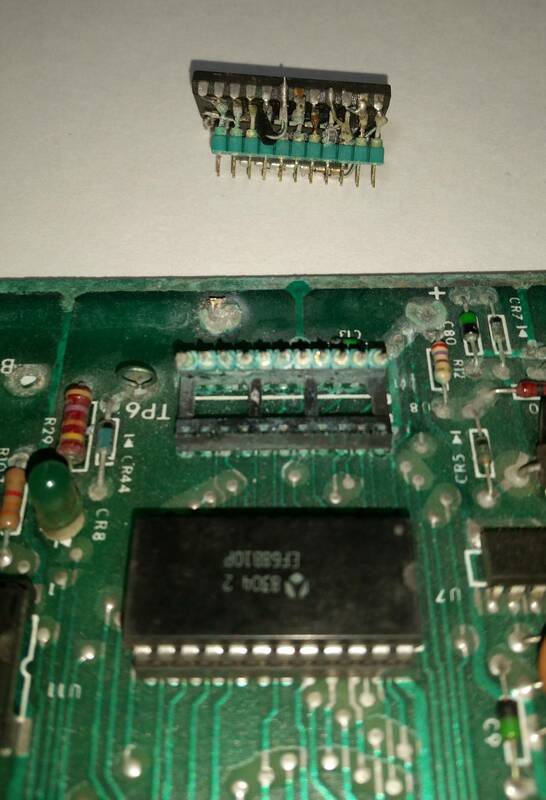 Cause why solder to a pin when you can rip the whole pin out of the board and solder the wire directly to the crispy hole? NOT A HACK BUT IT WOULD HACK YOUR FINGERS TO BITS . HAND STAPLES WITH 1 LEG FOLDED TO HOLD IN PLACE , 1 FOR CUTTING , THRU SPEAKER GRILL- NASTY!!!!! It looks like a hack to me. What are those staples supposed to do? Stop people from messing with the game! I'm not used to seeing people walking around with a stolen 6" speaker spinning on a piece of wire. I thought the objective was always the coin box . 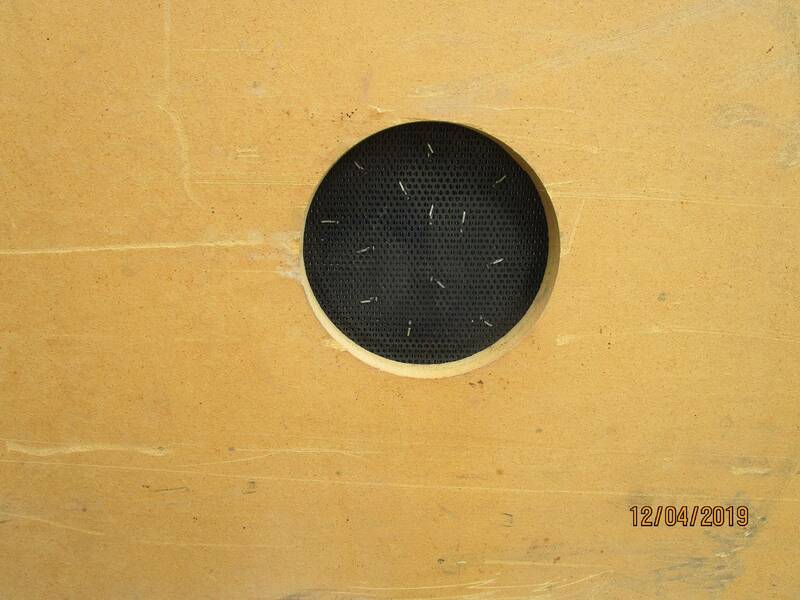 In the 80's the bad guys used to punch or kick on the speaker grille, so that the speaker got torn loose, and then grabbed coins from cashbox via the open speaker hole. There was a rumour that some operators then mounted razor blades to cashbox back edge. Probably just installing cashbox covers should have been enough. 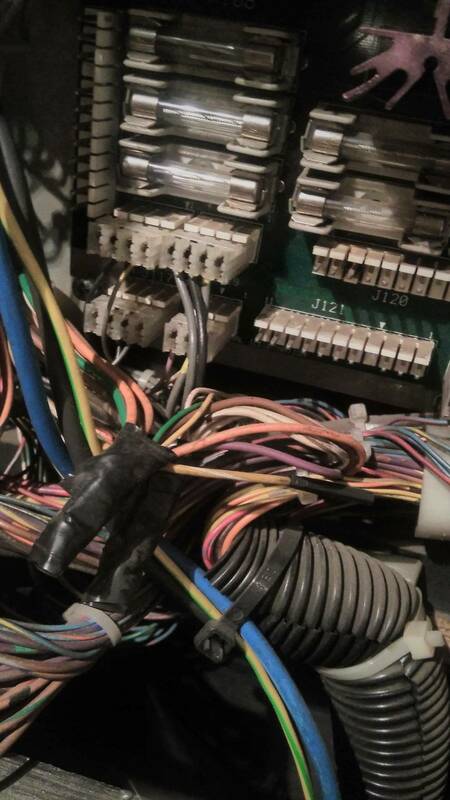 Too much effort, just jam the wire into the test port! 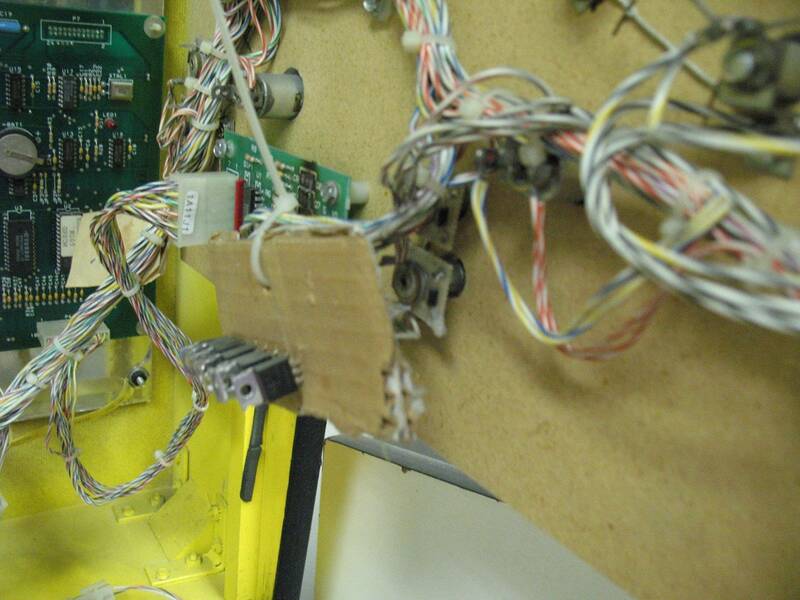 At the Bally service schools, students were taught to solder wires to the test points to bypass burnt pins. Quick and keeps the games earning. That makes sense. 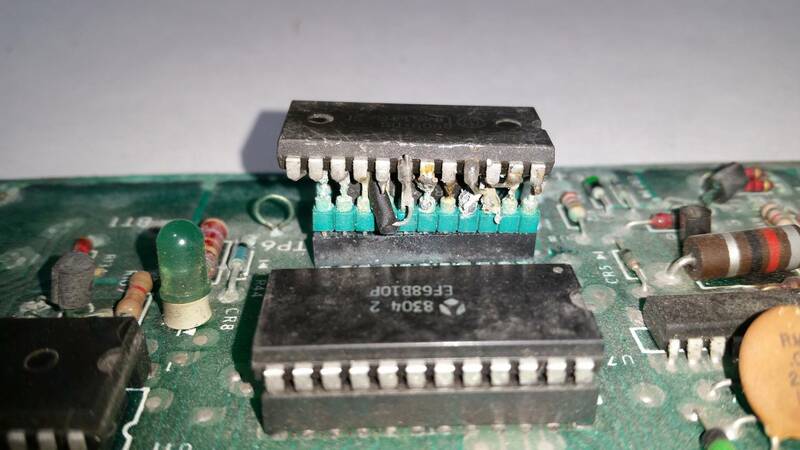 What is confusing me on this one is why the tech soldered the GI return wire to the test port and also soldered the other three wires to the pins instead of just leaving them in the connector wafer? I suppose the connector wafer could have been bad but didn't the techs at least carry some spare repair parts? Some of us did. One of the AID Kits from Bally had a good assortment of pins and connectors. There was a shortage of the wafer connectors at that time and they could be scarce. Also, if you were at a far location and had several more calls, the solder to the test point trick could save you several minutes so you did that and got out. Was a tech under a lot of pressure all of the time to keep the pins running? Was there any kind of preventive maintenance? 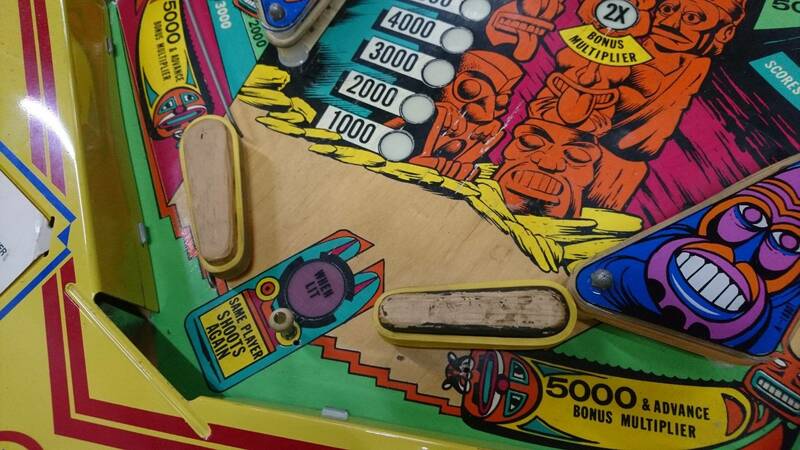 Was it always just chasing pins needing repair? Did the tech also empty the coin box or was someone else assigned that task? Or did the route owner trust no one and keep the coin box keys to himself? Was a tech under a lot of pressure all of the time to keep the pins running? Yes, all equipment. On Christmas Day & other major holidays the priority was Juke Boxes & cigarette machines though. Was there any kind of preventive maintenance? General cleaning of pins, rebuilding Flipper mechs., rubber ring & lamp replacement. 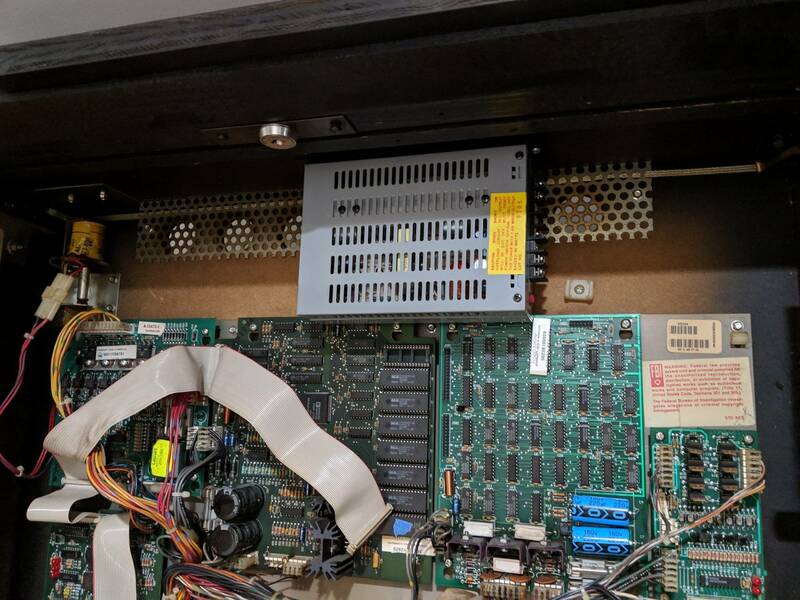 Cleaning video game monitors and cleaning / replacing moving parts on control panels. Marquee glass lamp replacement. 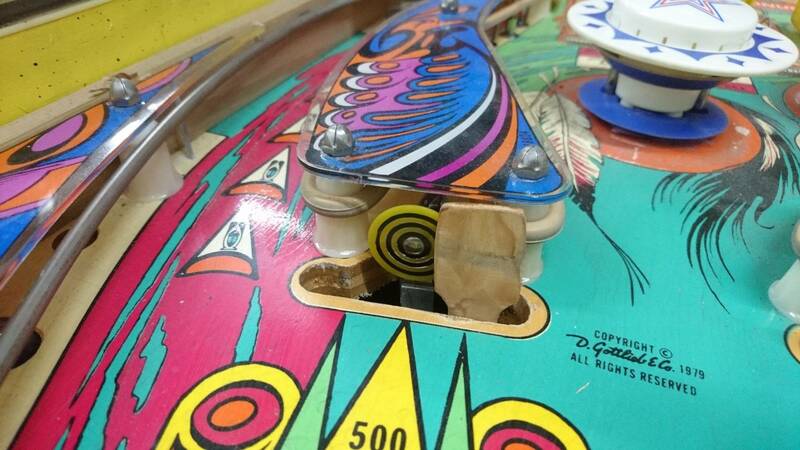 Was it always just chasing pins needing repair? No. Did the tech also empty the coin box or was someone else assigned that task? We had separate game and separate vending collectors who also refilled product. Also, we had separate cigarette collectors & machine fillers. They had armored vans with pretty good vaults. Cigarettes are a hot commodity. A few guys had guns put to their heads as they were getting back in the vans. Then we had to have armed guards go in a separate vehicle and stay near the vans. Or did the route owner trust no one and keep the coin box keys to himself? No. We did what we had to do to keep the games working. Had no internet to guide us. Odds are if there were repairs, the pressure was on to get it fixed, or replace it with a machine that worked. There was the opposite of desire to keep an inoperative pin on location, because it wouldn't be earning during that time. See above; I've been given the impression that preventive maintenance was reserved for actual off-location downtime. Don't take it down unless it's already gone down. Pinball operators aren't the only ones who operate like that; I've worked in printing for over 20 years now, and you only take a printing press down for maintenance, it seems, when there's literally no work for the press guys to do (including the bindery work! ), or the machine has broken. 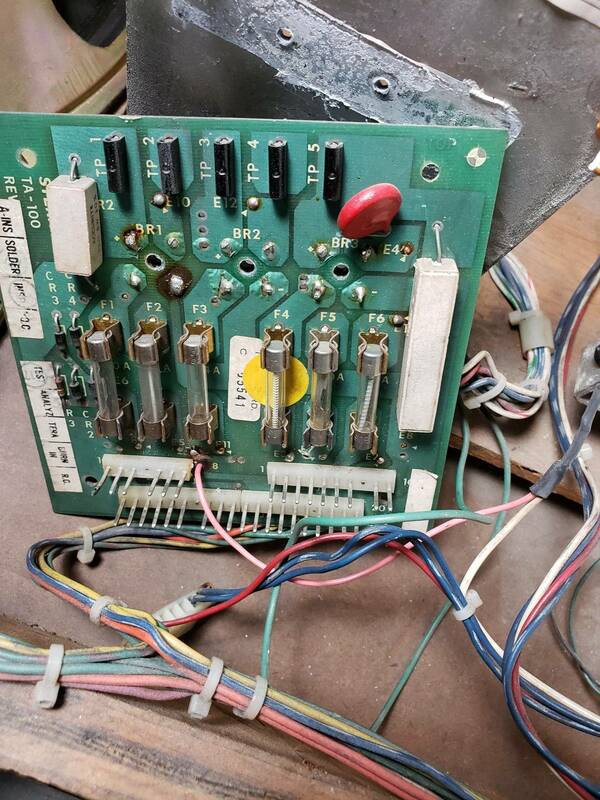 This explains why we still see pins with wires soldered to board pins and test points; it's working, just let it keep working that way and fix it right scrap the machine if that repair finally fails. 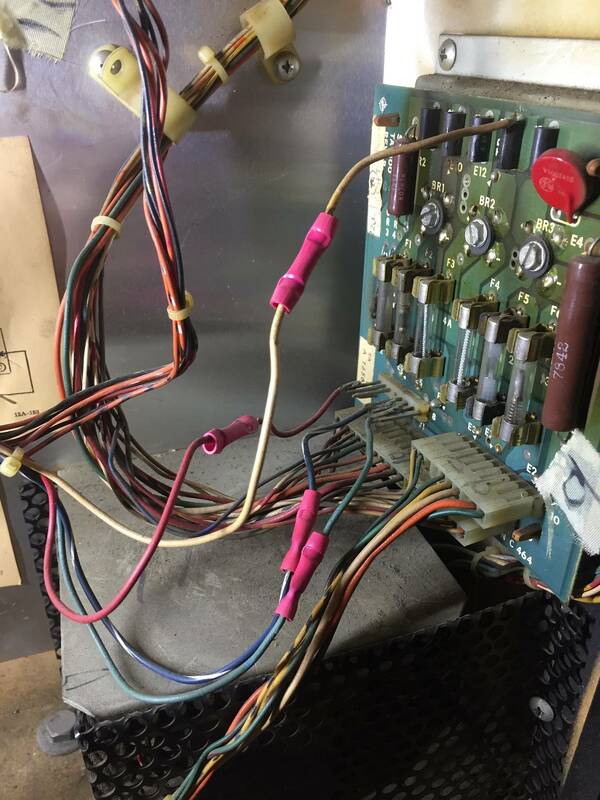 This explains why we still see pins with wires soldered to board pins and test points; it's working, just let it keep working that way and fix it right scrap the machine if that repair finally fails. I see. 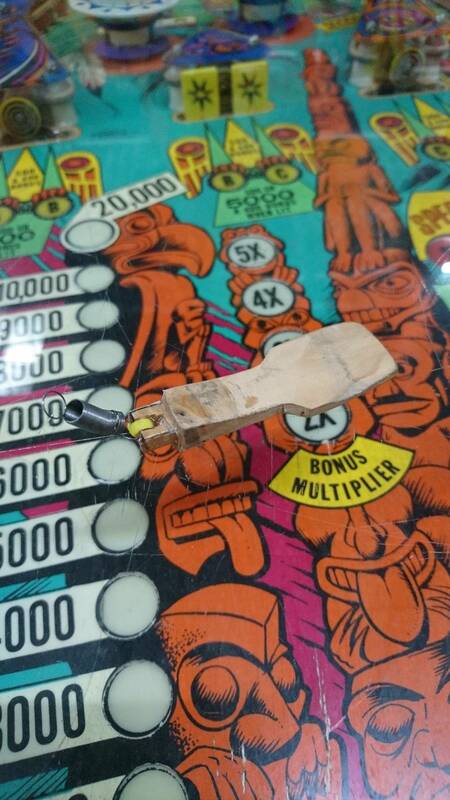 So the pin was "scrapped" way in the back somewhere and forgotten about. And years later the values start creeping up and someone remembers that old pin way in the back. It gets sold and the pinsiders get all nutty about a hack job while not understanding they are looking at a common practice from years gone by. Many common practices by operators could be considered hacks by home users who are under no pressure to quickly keep a game earning. I don't mind my game being down for a few days or more if I have to order the correct parts to fix it (most of which are now readily available online), but I definitely understand why an operator would do whatever it takes to fix a game the same day. I wonder if there would be enough old timer techs here that would be willing to share their stories and solutions for keeping a game on the floor that maybe a thread could be started along those lines? What is being called "hacks" I call jury rigging and I have done a lot of jury rigging on lots of different things thru the years; Mainly as a way to save money and not have to cough up a fortune to the manufacturer. Well... you see that mentioned a lot in this thread. People who don’t understand the history of some things. Some are simply “quick jerry rigs”... some were “conventional methods” to bypass known problematic things... and many are just dirty hacks done to either get it done quick, or done to get around not having the right parts. The conventional bypasses are usually covered in the repair guides like clays guide, or pinwiki, etc. less of these are needed these days as games don’t get as stressed in home use, and problematic designs are documented pretty well these days. There is a difference between hacks that are creative and interesting... verse ones that are destructive or dangerous . But in that same vein... you can usually spot the difference between hacks that were purpose driven verse lazy. in order to "fish out" the quarters.